Everyone is buzzing about the Powerball Lottery, but I didn’t buy a ticket. I never do. The ticket in below’s photo, is one that someone left behind, on a gas station counter, several months ago. Why? They didn’t win. Only one person wins the lottery. That leaves a lot of disappointed people, a lot of losers when so many people are hoping for a chance. But people hope, and buy a ticket…”Just in case!” After all, the lottery winner will receive a lot of earthly treasures, and those mansions, pools, and cars sure do look nice! But what if I told you the lottery winnings are trash compared to what God is storing up for His children up in Heaven? When you accept Jesus into your heart, you receive the greatest gift you could ever hope for…eternal life in Heaven! In Heaven there is beauty and joy that our small human minds cannot even imagine! In Heaven, we will also have eternal fellowship with our loved ones, who also accepted God’s free gift. Who needs the lottery, when God’s winnings are for everyone? Earthly riches fade away. And even if they last for a while, we won’t last long enough to enjoy them. They won’t fulfill us either. That’s why many rich people remain unhappy. They are surrounded by stuff, but their hearts are empty. They are lost without Jesus. With God, everyone gets picked! Yes! He picked you to receive His greatest prize! All you have to do is be willing to receive it. God’s son, Jesus Christ, is available to everyone. Anyone who wants forgiveness for their sins can receive salvation. Salvation is better than any jackpot, because it’s eternal! Jesus comes with love that will fill you up in a way money never will. Did you know God is up in Heaven building mansions for His children? The mansions on earth pale in comparison. We will laugh at lottery prizes one day, as if they are dirty, old, broken toys, passed over at a yard sale. God’s gifts are perfect. Our minds cannot even conceive of the great riches God has in store for His children! Didn’t win the lottery? There’s a silver lining! When you say yes to Jesus, you’ll have something even better! 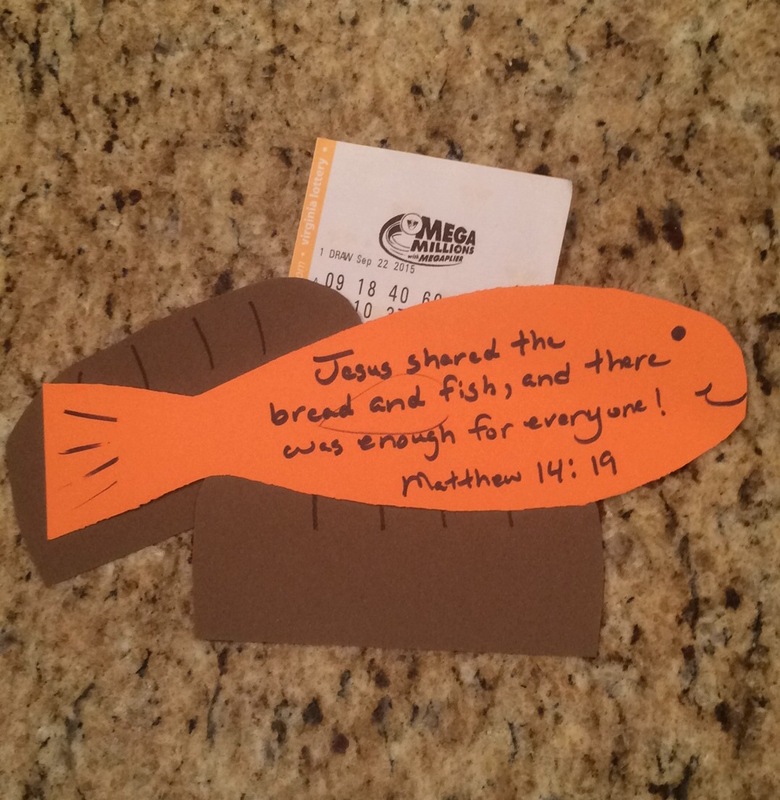 Jesus took five loaves and two fish, and he fed 5,000 people! When he performed this miracle, there were even twelve baskets of food left over! With Jesus, there is always enough to go around! It’s better than winning a share of the lottery! Did you win the lottery? Don’t go pick up your prize, until you first say yes to Jesus. You’ll need him as you navigate your way through your new life of unchartered waters. “My Father’s house has many rooms; if that were not so, would I have told you that I am going there to prepare a place for you? And if I go and prepare a place for you, I will come back and take you to be with me that you also may be where I am” (John 14: 2-3 new International Version). YOU are awesome! Many Blessings to You! so thankful that our hope is real, through Jesus! All things are possible through Christ which strengthenth me! Phil. 4:13. Thank you! I needed that one today! God bless you!